By: Korb, Lawrence J.; Duggan, Sean E.; Juul, Peter M.; Bergmann, Max A. 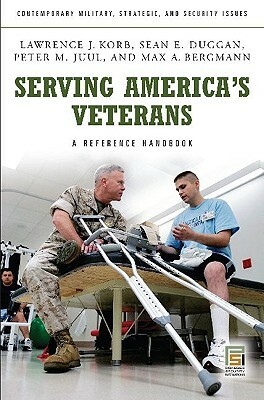 "Serving America's Veterans: A Reference Handbook" comes from an impeccable source--former Assistant Secretary of Defense for Manpower, Reserve Affairs, Installations, and Logistics Lawrence J. Korb. Korb and his team of experts survey, analyze, and evaluate the infrastructural conditions, administrative and health care service challenges, policies, and politics affecting veterans affairs in the United States. They overview the historical context of contemporary veterans affairs and project the capabilities of the Veterans Administration to cope with the needs of active, reserve, and retired veterans. Most critically, they provide practical prescriptions and policy recommendations to address veterans' many, pressing needs. The full spectrum of veterans issues is examined: changing personnel policies in the armed forces; unprecedented levels of National Guard and Reserve mobilization; societal reintegration and funding adequacy when the professional military is a relatively small fraction of the U.S. electorate; rising costs of medical technology; and the growing proportion of veterans with conditions requiring protracted rehabilitation or lifelong intensive care. Author Name: Korb, Lawrence J.; Duggan, Sean E.; Juul, Peter M.; Bergmann, Max A.